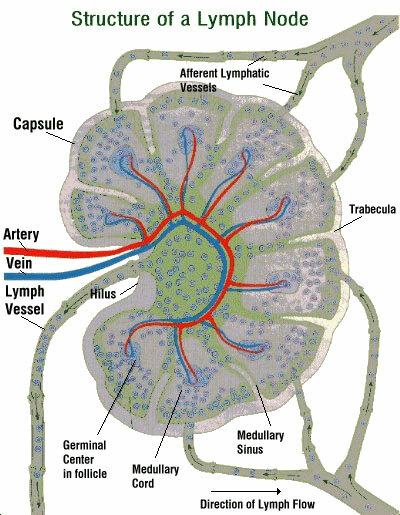 The lymph nodes are small but essential parts of the human lymphatic system, which forms part of the bigger human immune system. The nodes are actually filters that are useful in taking out harmful particles from the body and in fighting off bacteria. When ill, some people may notice that one or more of their lymph nodes are swollen. This is because the nodes are working overtime in order to have more white blood cells that are essential in fighting off infections. Lymph nodes that are swollen can also be a sign that a person has a more serious medical condition such as cancer. The lymph nodes form an extensive and interconnected system that transports a clear to yellowish fluid called lymph all through the body. The fluid contains lymphocytes, which are white blood cells, along with some red blood cells and proteins. With the fluid, the body can fight off infection better and as it goes through the nodes, infectious particles such as bacteria are taken out of the lymph flow, preventing them from circulating further through the whole body. There are literally hundreds of lymph nodes that can be found throughout the human body and when it is in its normal size, it is the size and shape of a bean. The inside of the node looks like a honeycomb. These are actually fibrous tissues that protect the node and the honeycomb design acts like a filter that takes out particles that are too big to pass through them. If you want to feel one of your lymph nodes, you can find it just under the jaw, beside your tonsils. Once a harmful element has been neutralized by the lymph nodes, it is again released into the lymph system to be secreted out of the body along with the other wastes from the body. Some forms of healing focus on stimulating the lymph flow in the body so that it can take out toxins better.